They called the fight “Bad Blood.” It was a marketing angle that wrote itself. In 2002, Oscar De La Hoya and Fernando Vargas met in a clash of Mexican-American U.S. Olympians from southern California, bringing the two biggest draws at 154 pounds together for a monster pay-per-view event that was powered by a bitter grudge. In a special edition of the HBO Boxing Podcast, Eric Raskin speaks to De La Hoya, Vargas, and numerous insiders who were at the Mandalay Bay in Las Vegas that night and lets them tell the story of a modern classic, a showdown in which scores were settled and blood was spilled. HBO Boxing Insiders Eric Raskin and Kieran Mulvaney recap Saturday night's Boxing After Dark tripleheader featuring victories for Cecilia Braekhus, Claressa Shields, and Juan Francisco Estrada, plus they share reflections and memories from the podcast's run. The record will show that Cecilia Braekhus defeated Aleksandra Magdziak-Lopes tonight under the stars on a cool evening at the StubHub Center, that Juan Franciso Estrada stopped Victor Mendez and that Claressa Shields outpointed Femke Hermans to run her professional record to 8-0. And yet, on this strangest of nights, in which boxers traded their punches in front of a small crowd, the stories of the individual fights were all but lost in a broader narrative. For all six competitors in the three bouts, Saturday night was just the latest step in an ongoing career progression. But for so many others, the theme of the evening was of finality. In the opener, Shields was seconds away from dropping and possibly stopping Femke Hermans (9-2, 3 KOs), but was forced to settle for a unanimous shutout decision over 10 rounds. Shields, a two-time Olympic gold medalist, has agitated for women to be permitted to fight three-minute rounds like their male counterparts, as opposed to the abbreviated two-minute frames they are presently obliged to contest, and understandably so: on several occasions during the contest, Shields (8-0, 2 KOs) appeared to have Hermans hurt, only for the bell to ring before she could press home her advantage. The American’s hand speed was vastly superior to that of the less-experienced Belgian, and her punches accordingly carried greater snap and heft; in particular, the Shields left hook proved an increasingly effective punctuation to her blistering combinations. It was one such hook that detonated on Hermans’ jaw in the dying seconds of the contest, spinning the Belgian’s head around and leaving her reeling. Shields was able to half-land a follow-up right hand as Hermans stumbled forward, but time expired before she could deliver the coup de grace. In the co-main event, bantamweight Juan Francisco Estrada was, however, able to score a stoppage win when opponent Victor Mendez elected not to emerge from his corner after seven increasingly one-sided rounds. Mendez (28-4-2, 20 KOs) strode forward purposefully at the start of round one, looking to utilize his greater height and reach and working behind stiff, straight punches. But fellow Mexican Estrada (38-3, 26 KOs) soon established himself as being of an entirely different caliber. Calmly landing sharp combinations in the second, and steadily increasing the pressure as the rounds unfolded. Estrada retreated enough to encourage Mendez to come forward and throw punches, but not so much that he yielded the center of the ring, from where he took advantage of the opportunities that his compatriot’s aggression afforded him. In the fifth, Mendez upped his punch output in an attempt to battle his way to even terms, but in doing so he played into the hands of Estrada, who ripped repeatedly into the Mendez torso. 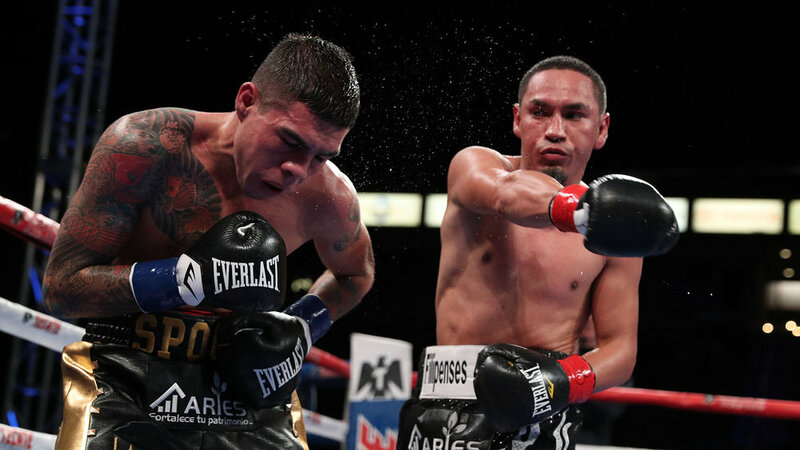 By the sixth, Mendez was fading as Estrada turned aggressor, a short right hand behind a left hook clearly hurting Mendez and sending him into retreat for the rest of the round, and although Mendez attempted to stage a rally in the seventh, it was to no avail. He returned to his corner at the end of the seventh and slumped on his stool, where his team elected to keep him. And then just one remained. Cecilia Braekhus, who seven months earlier had been the first female boxer to feature on HBO, as she recovered from a knockdown to score a decision win over Kali Reis in this same StubHub ring, returned to close out the card, the night, and a boxing franchise against Aleksandra Magdziak-Lopes. Braekhus is widely regarded as the best female boxer in the world, pound-for-pound, a consequence not just of her natural talent and her tutelage under experienced trainer and former fighter Jonathan Banks, but also two decades of experience that began when she shimmied her way down a drainpipe outside her window as a 14-year-old to train furtively in a local MMA gym. Magdziak-Lopes, in contrast, did not begin boxing until her thirties, and for all her obvious athleticism and strength, that gulf of experience showed. Magdziak-Lopes (18-5-3, 1 KO) showed immense heart and smarts, but simply didn’t have the toolkit or the fluidity to compete on level terms with the more versatile champion. Braekhus (35-0, 9 KOs) sought to find that special punch that would pierce the Magdziak-Lopes guard and bring the evening to an early close, and although she was unable to do so, by the fourth round, she had rendered her opponent increasingly uncomfortable as she fired punches from angles that her foe could not match. With the encouragement of her trainer-husband, Magdziak-Lopes sought to rally in the final couple rounds, but even as she did so, Braekhus simply moved up through the gears once more. There could be no doubt about the decision, and nor was there, Braekhus winning all ten rounds on two cards and nine on the other. Afterward, Braekhus apologized for not scoring the knockout – partly a consequence, she said, of her being over-eager to do so. She went off to find Cris Cyborg, who was waiting ringside and who has expressed enthusiasm for meeting Braekhus in what would be surely the biggest fight that could be made in women’s boxing. The lights went down, the small crowd dispersed, and it was all over. CARSON, CA. – Seven months ago, Cecilia Braekhus made history. 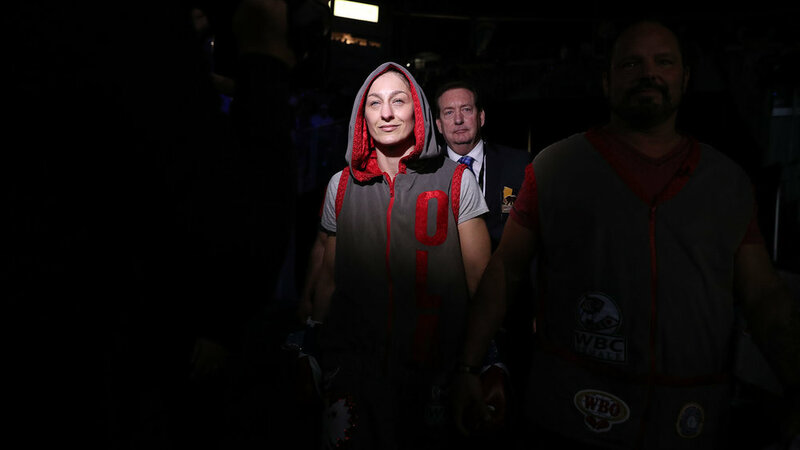 When her hand was raised in victory at the end of a hard-fought decision over Kali Reis at the StubHub Center in May, on the undercard of Gennady Golovkin’s demolition of Vanes Martirosyan, she became the first female boxer ever to win a fight on HBO. A little more than half a year later, she will make history again. Her clash this Saturday night (10:20 PM ET/PT) with Aleksandra Magdziak-Lopes will be the HBO main event – which for female fighters is unprecedented, and will also be forever unmatched, as theirs will be the last fight of any kind to be aired on the network. Braekhus, while acknowledging the significance of the event, chooses not to dwell on it, at least not yet. “You know what? When I’m old and retired, I can look back and I can really, really say that I made history.” For now, she is fixing her attention on Magdziak-Lopes, fully aware that her foe is made of stern stuff. That said, on the three previous occasions that Magdziak-Lopes has challenged for a world title belt, she has fallen just short. Braekhus can expect another tough night but will anticipate it ending with her in position to move on to one of the higher-profile challenges that await. Perhaps that challenge will be in the form of MMA star Cris Cyborg, who has long coveted a bout with the Norwegian, who was ringside when Braekhus fought Reis, and who will be present again on Saturday – and who will in fact be walking to the ring with another possible future Braekhus opponent, Claressa Shields, who opens the HBO broadcast against Femke Hermans. For Shields – who is facing Hermans just three weeks after defeating Hannah Rankin to run her professional record to 7-0 – Saturday night is an unexpected opportunity to realize a lifelong dream. At the end of the day, however, boxing is boxing, whoever is filming or calling the action, and what matters most is what happens when the combatants enter the ring. Asked to predict how events will unfold on Saturday night, Shields underlined that when that happens, issues of history, weight class and gender are largely irrelevant, and the attractions that keep people tuning in to watch boxing are fundamental and simple to articulate.